The next best thing to healthy, natural teeth, dental implants fill spaces in your mouth where a tooth or multiple teeth have been lost. They look, feel and function like natural teeth thereby giving confidence to patients in daily life. 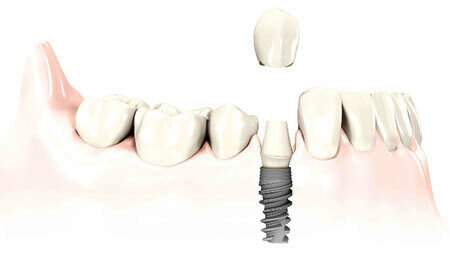 In addition, implants help to maintain the natural shape of your face and smile, hence improving appearance and speech. There is no longer a need for dentures so you can virtually eat anything without hesitation or worrying about dentures getting damaged. Overall, this is a long term solution, while implants may need periodic adjustments they can last a long time when properly cared for. Dr Amit Bhalla, our principal dentist, is currently taking further courses in implant dentistry at the prestigious Campbell Academy. This course will benefit patients by offering them new treatment and services. The initial stage of the treatment will involve a consultation with Amit to discuss your needs and options. Amit’s caring and relaxed approach which will help to put the minds of our most nervous patients at ease, to ensure they are receiving the best possible care. Furthermore, to help patients finance these effective treatments, Gipsy Lane Dental have introduced a new finance scheme at 0% APR offered over 12 months. Please speak to a member of staff for more information. Here at Gipsy Lane Dental we are proud to restore the smiles of our patients with dental implants from Strauman® - an innovative company with market leading dental implant systems of the highest quality. At Gipsy Lane Dental our approach is simple, we believe in offering the best in personalised dental care and state of the art technologies set in the comfort of a relaxed and safe environment. This means we believe in ensuring each of our valued patients feel fully comfortable and confident in every step of their treatment. Why Dental Implants to replace missing teeth? When you lose a tooth, it disturbs the interplay between teeth and bone. Because gum and bone are no longer stimulated well enough due to the missing tooth, the jaw bone starts shrinking and your gum pulls back. This can weaken neighboring teeth until they collapse. Teeth in the opposite jaw can then start growing into the gap. The more teeth are missing, the more challenging it can become to replace them. A single lost or damaged tooth can influence your daily life. Even though it may be at the back of your mouth and not visible from the outside, over time it can start affecting your appearance, self-esteem, your oral health and even your health in general. Learn more about what role each tooth has to play in your mouth, the consequences of tooth loss and when to contact a dentist.